You can travel to this temple by reaching Katra, which is the base for this shrine. The shrine is located at a distance of fourteen kilometers from Katra, and the journey uphill can be carried out either through foot (which is the preferred option), or through palanquins and ponies. Katra the holy shrine is 48km away from Jammu is a small town in the foothills of Trikuta serves as the base camp to Mata Vaishno Devi devotees. As per the legend, during the period when the Goddess was busy in annihilating the Asuras, Her three main manifestations viz. Mata Maha Kali, Mata Maha Lakshmi and Mata Maha Saraswati got together one day and pooled their collective Tejas or spiritual strength. A stunningly bright light emanated from the place where the Tejas of the three manifestations coalesced and a beautiful young girl emerged out of this Tejas. The young girl asked them, "Why have I been created?'' The Devis explained to her that they had created her so that she would live on earth and spend her time in upholding righteousness. The Devis added, "Now, go and take birth in the house of Ratankar and his wife who reside in the southern part of India, and who are great devotees of ours. Live on earth. Uphold righteousness and evolve yourself spiritually so that you reach higher levels of consciousness. Once you have attained the appropriate level of consciousness you will merge into Vishnu and become one with him.'' So saying they blessed the girl. Sometimes later a very beautiful girl child was born to Ratankar and his wife. The couple named the child Vaishnavi. The girl right from her childhood displayed a hunger for knowledge which was like a vortex and which no amount of teaching and learning could sufficiently satiate. Subsequently, Vaishnavi started looking into her inner self for knowledge, and soon learned the art of meditation and realized that meditation and penance only could bring her close to her greater objective. Vaishnavi thus relinquished all household comforts and went deep into the forest for Tapasaya (meditation). Meanwhile, Lord Rama, during his fourteen years of exile happened to visit Vaishnavi who recognized him immediately as no ordinary being but the incarnation of Lord Vishnu, and immediately asked him to merge her into himself so that she could become one with the supreme creator. However Lord Rama, knowing that it was not the appropriate time, dissuaded her by saying that he would visit her again after the end of his exile, and at that time if she succeeded in recognizing him, he would fulfill her wish. True to his words, Rama visited her again after being victorious in the battle, but this time he did so in the disguise of an old man. Unfortunately, Vaishnavi was unable to recognize him this time and was distraught. Upon this, Lord Rama consoled her that the appropriate time for her being one with the creator had not come, and that time would come eventually in 'Kaliyug' when He (Rama) would be in his incarnation of 'Kalki'. Rama also directed her to meditate, and set up an Ashram at the base of Trikuta hills, to elevate her level of spirituality so as to bless mankind and rid the poor and destitute of their sufferings. Only then would 'Vishnu' merge her into himself. Vaishnavi, immediately set off for the northern part and after immense hardships, reached the foot of the Trikuta Hills. After reaching there she set up her ashram there and began to meditate. As predicted by Lord Rama, her glory spread far and wide, and people began to flock to her Ashram to seek her blessings. As time passed, a Tantrik named Gorakh Nath who had a vision of the episode between Lord Rama and Vaishnavi in the retrospective time frame, became curious to find out whether Vaishnavi has been able to attain a high level of spirituality or not. He, therefore, sent his most able disciple 'Bhairon Nath' to find out the truth. 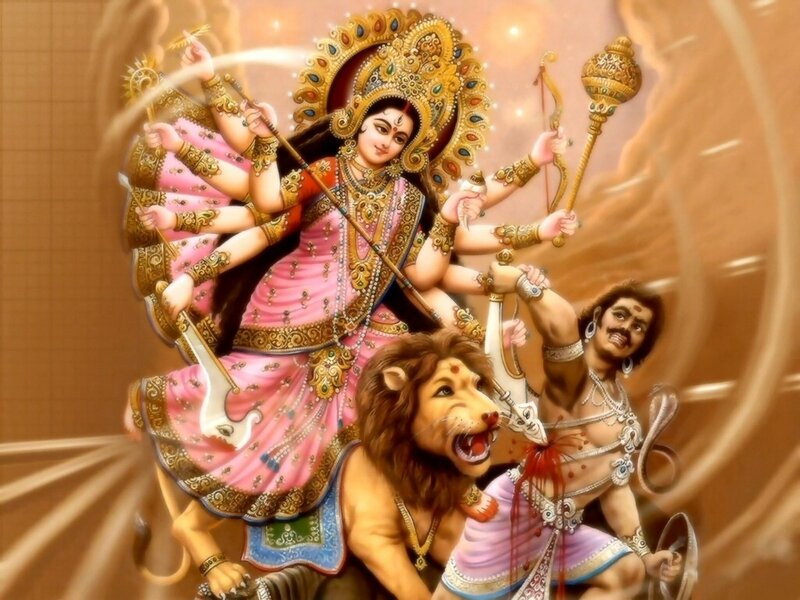 Bhairon Nath on locating the ashram started observing Vaishnavi secretly, and realised that though a 'Sadhvi' she always carried bow and arrows with her, and was always surrounded by langoors (apes) and a ferocious looking lion. Bhairon Nath was enamored by Vaishnavi's extraordinary beauty, and losing all good sense he began to pester Vaishnavi to marry him. Meanwhile a staunch devotee of Vaiashnavi, Mata Sridhar organized a Bhandara (Community meal) in which the whole village and Guru Gorakh Nath along with all his followers including Bhairon were invited. During the course of Bhandara Bhairon Nath attempted to grab Vaishnavi but she tried her best to daunt him. On failing to do so, Vaishnavi decided to flee away into the mountains to continue her Tapasaya undisturbed. Bhairon Nath however chased her to her destination. The goddess after halting at (present day) Banganga, Charan Paduka, and Adhkwari, finally reached the holy cave Shrine. When Bhairon Nath continued to follow her despite the goddess trying to avoid a confrontation, the goddess was compelled to kill him. Bhairon Nath met his ultimate fate when the goddess, just outside the mouth of the cave, beheaded him. The severed head of Bhairon fell with a force at a distant hilltop. Bhairon Nath upon death realised the futility of his mission and prayed to the deity to forgive him. The almighty Mata ( Mother Goddess) had mercy on Bhairon and gave him a boon that every devotee of the goddess would have to have the Darshans of Bhairon after having the Darshans of the Goddess and only then would the yatra of a devotee be complete. Meanwhile, Vaishnavi decided to shed off her human form and assuming the face of a rock she immersed herself into meditation forever. Thus Vaishnavi, in the form of a five and a half feet tall rock with three heads or the Pindies on the top is the ultimate destination of a devotee. These Pindies constitute the Sanctum Sanctorum of the holy cave known as the shrine of Shri Mata Vaishno Devi Ji, which is revered by one and all. Placed at a distance of 70km from the town, Shivkhori or the Holy Cave in the shape of the Damroo of Lord Shiva which is about half a kilometer long and has a 4feet high naturally formed Shiv-lingam right in the heart of the Sanctom Sanctorum. The most attractive feature of the cave is the sight of the natural milky water falling from the top of the Lingam signifying the eternity of the river Ganga. Aghar Jitto or the Shrine of Baba Jitto, a devotee of Maa Vaishno Devi is situated at a distance of 5km from the town. It is believed that if any pre- natal woman takes a dip in the holy spring water flowing in front of the shrine, safe delivery of baby is assured. Located at a distance of 30 kms from the town, Dera Baba Banda is one of the revered Hindu-Sikh pilgrimage centre. Baba Banda Bairaagi also known as the 'Saint Soldier' of Guru Gobind Singh. The Gurudwara built by Baba Bairaagi on the banks of river Chenab is frequented by people of other faiths. The ancient temple of Goddess Kali located inside the Bahu Fort built by Raja hu Lochan is frequented by a large number of tourists. The temple is hardly 4km from the Jammu Railway Station. The Jammu Railway station located at a distance of 50kms is the nearest railway station from Katra. Jammu is easily accessible from any part of India as it enjoys healthy rail network.